What Does Your Auto Website Look Like on Mobile? A good auto website takes design into consideration. What do your customers see when they first land on your page? Your design should convey something about your business and your values. A sleekly designed webpage will tell your customers quite a bit about your business before they begin reading or set foot on the showroom floor. There’s one more thing you may want to consider about your auto website. What does it look like on mobile? In the past decade or so, web design has matured as a discipline. Gone are the days of Geocities and flashing, blinking text. Today’s consumers expect websites to be more like the glossy pages of a magazine, and for the most part, companies are happy to oblige. Good design can communicate many things about your company. A website design can be “fun” or it can communicate a sense of luxury to the consumer. Check out some sites from luxury automakers. What impression do they give you? You may even try visiting other sites and think about what their design communicates to you. Of course, design also has a purpose. It makes your website easier to navigate and use. Amazing photography and engaging video won’t matter quite as much if the customer can’t find the information they’re looking for. The best website design, then, combines form and function. The design helps customers navigate to find the information they want as it communicates your brand messaging. One thing auto dealers should be keeping an eye on is the shift in how people are using the internet. Traditional web design only needed to worry about people accessing a website on a desktop computer. Today, however, the picture is changing. More people are accessing websites on mobile devices, such as smartphones and tablets. Many of your potential customers are viewing your site on their cellphones as they wait for their appointments at the doctor’s office or while they’re watching the game on TV. With so many users now accessing websites via mobile, making sure a website is designed for mobile visitors is no longer a luxury. It’s important for anyone with a website. Your customers depend on you to deliver a seamless experience on whichever device they’re using. Most traditional web design doesn’t translate well to mobile platforms. 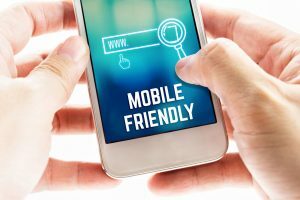 If your website isn’t mobile-friendly, your clients and potential customers could find the experience frustrating. They may not be able to navigate or find the information they want. The end result is often the same. The visitor leaves your website and visits one of your competitors instead. There’s an easy way to turn this narrative around, and it’s to ensure your auto website is designed to be mobile-friendly. Whether someone visits on their desktop or their phone, they’re greeted with the same seamless experience. Designing for mobile takes into consideration a few different factors. One is different operating systems. Mobile devices and desktop computers use different programs. Another issue is screen size. Mobile-friendly sites are designed to be responsive, meaning they resize and reorient themselves to the screen they’re being viewed on. As more and more people visit websites on mobile, auto dealers should give thought to how their website appears. If you’re using mobile-friendly design, you’re already one step ahead. If you haven’t adopted it yet, it may be time to talk to someone about changing the situation. It’s easy, and it will help you provide a better customer experience for all your website visitors.